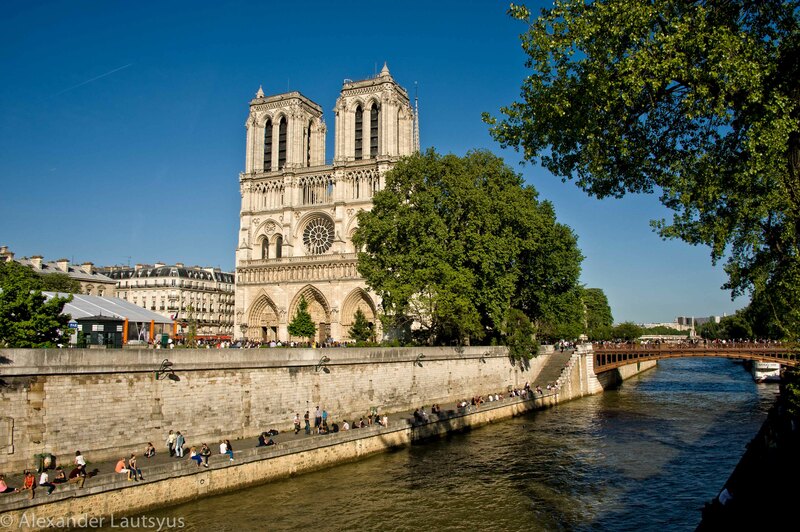 Notre Dame in Paris is one of the most attractive landmarks. The Cathedral is the most famous in the world thanks to its location, architecture, and numerous references to various historical and artistic works. It is situated on the island in the Seine – Île de la Cité. This is why it can be observed from different points and demonstrate its beauty – architectural details, sculptures on the façade and on the roof, rose windows, and famous gargoyles. The interior decorations are pretty simple. 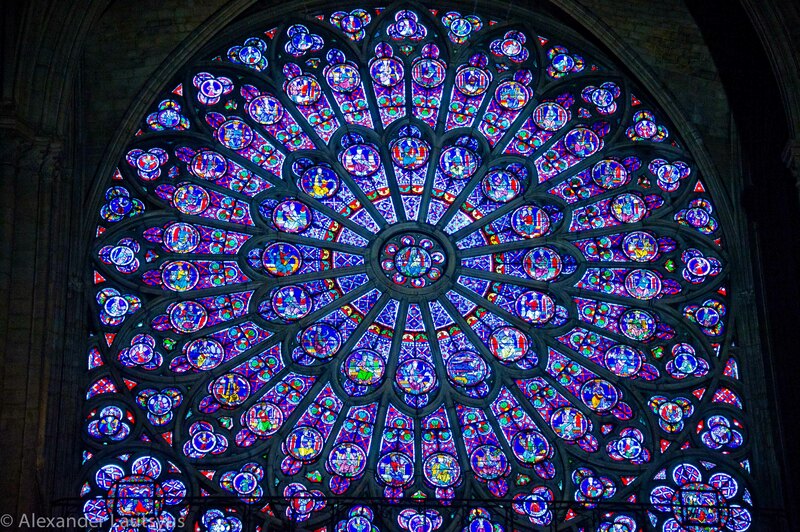 The only things that make interior colourful and beautiful are rose windows with its stunning glass. However there is one thing which makes Notre Dame fascinating inside is acoustic. Thanks to it the organ and choir sound clear and powerful. It cannot leave you indifferent. The worship is kind of magical performance where the faithful and clergymen act like one body. The spirit of eternity is flying here. 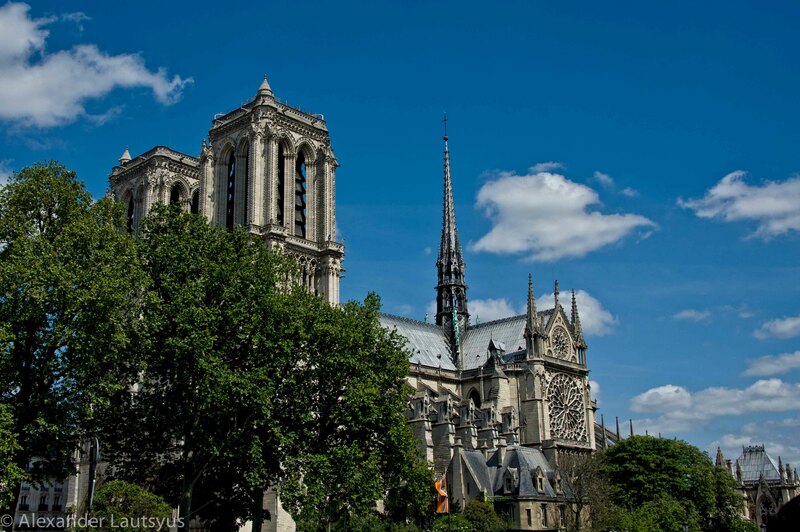 Notre-Dame is looking gorgeous from any place and at any time of the day. Enjoy the gallery! This entry was posted in Europe, France and tagged France, Gargoyle, Journey, Notre Dame, Notre Dame Altar, Notre Dame at Night, Notre Dame from Seine, Notre Dame in Dusk, Notre Dame Sculptures, Paris, Rose Window, Travel. Bookmark the permalink. These photos are incredible. It has totally opened my eyes to another culture. Thank you. Thank you! I am happy you found something new for yourself through my picture. Thank you, Scott. Lovely city! Unfortunately, today Paris is associated with terror, grief and sadness. I hope people of Paris will recover from that tragedy. Thank you Shona, it is for sure beautiful rose window. This kind of windows have their own charm in every single cathedral in the world. They are so different but have one thing in common – Beauty! I would love to hear the sound in this cathedral! I sang in the Washington Cathedral when I was in high school and it was a powerful experience. The high ceilings let the sound rise up to touch the heavens and the stone amplified it all. Wish I had been with you to hear the music. Acoustic is great in Cathedral and the real sound do not interfere with the echo. That’s why you can hear every single word of the song. Music penetrates you. It is beautiful experience. Oh, Alexander, your photographs of Notre Dame are wonderful, wonderful. I agree! It’s a magical, magical place. What a gorgeous photo essay. You captured every nook and cranny. I especially love the sunset series. The sky is so blue. Not a dud in the batch! Thank you, Theadora, for your emotional comment. Well, thanks for the inspiration! Thanks for a remarkable tour in Paris, Alexander. As always your photos of people is fascinating. Thank you, Cindy! This is remarkable place in Paris!